iOS 4x to 9x - How it has Evolved? 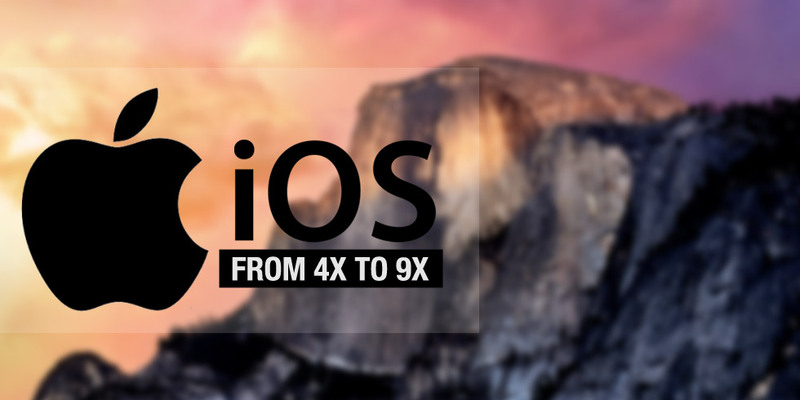 iOS 4x to 9x – How it has Evolved? January 9th, 2007 marked a paradigm shift in the world of mobile phones. Steve Jobs introduced iPhone to the world in what is often said to be one of the best presentations ever made and the rest they say is history. In the last eight years iPhone has enjoyed cult following and continues to be the most desired gadget in the world. Over the years Apple has set the trends for others to follow. With millions of apps on the App store, companies offering iOS/iPhone app development are laughing their way to the banks. Here we go back in time and see the developments from iOS 4 to iOS 9. It was here that iPhone OS changed to iOS as Apple came out with the iPad. This version of iOS was most notable for introducing the concept of multi-tasking. It introduced a number of apps that allowed power users to get the best out of the phone. Features such as Wi-Fi tethering, spell-check, unified inbox and multiple exchange accounts were introduced in this version to compete with the challenges posed by Android. This version is most notable for introducing Siri- Apple’s intelligent personal assistant and knowledge navigator which replaced the Voice Control. It also came out with Notification Centre that allowed users to get complete control over a barrage of notifications that came in from different apps. The short messaging service iMessage was also introduced which allowed users to send text messages without having to pay any costs to the carrier.Twitter was added to the list of default apps. Apple took on Google head-on by doing away with Google Maps in iOS 6. It introduced a new mapping feature which had the turn-by-turn feature (the first time for any mapping app). Enhancements were made to Siri and Notification Center that enhanced their usability. Facebook became a part of the factory shipped phones. Other features introduced included the Passbook, Shared Photo Streams and iCloud Tabs. This release was known for the apology offered by Tim Cook for the maps app launched in the previous version that didn’t go well with the users. However, this version also introduced the Control Center, which was Apple’s version of quick-settings similar to Android’s phone settings. AirDrop, the ad-hoc sharing system, was the biggest addition in iOS 7 and allowed users to share images, videos, and other files at a faster pace. Other additions were iWork, iTunes Radio and FaceTime Audio. This was more about updating the already existing features and functionality of the previous version of the app. Siri was upgraded to allow users to activate it with a voice command and so was iMessage that came up with self-destructing audio messages, location sharing, and new additions to the video-message interface Nonetheless it did introduce a number of functionalities and these included the addition of HomeKit, HealthKit and Family Sharing. iOS9 has introduced a whole load of interesting and intuitive features, which will take user experience to the next best level. This new version has integrated intelligence throughout the OS, and offers a more stable battery life. The enhanced multitasking feature will induce productivity in your tasks. Slide over, and split view are features offered to facilitate multitasking. Integrating Siri and Search (previously known as Spotlight) have introduced proactiveness in the system. iOS9 is aware of contextual information, and offers the same proactively to the users. 3D touch, available with iPhone 6s and iPhone 6s Plus has been deeply incorporated in this OS. It is offering a completely revamped set of features to enhance interactivity with iOS devices. To get apps developed for the latest series of iPhone and iPads you need services of professional iPhone apps Development Company. Semaphore Software would fit the bill perfectly as they have years of experience in iOS development. Get in touch with us at info@semaphore-software.com and we would translate your ideas into an app.